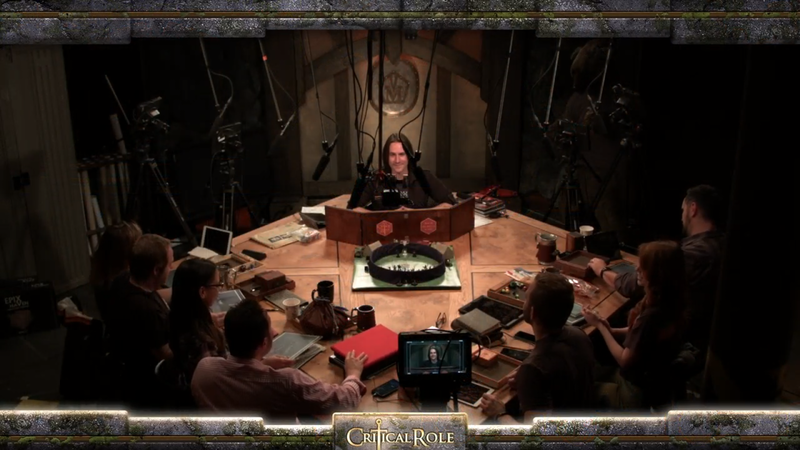 Thursday night, Critical Role opened their second campaign (called by some Season Two, as if having 2.5 year, 100+ episode seasons is a thing). Starting a new campaign is rife with peril, as while the DM (hopefully) has an idea of what the campaign should be and the players have ideas of who their characters are and can be, the real magic (and the real danger) comes from when those expectations meet, conflict, and (hopefully) adapt. A new campaign on stream has the extra degree of difficulty of the (typically wholly unrealistic) expectations of the audience, who in this case just got done watching the same cast of players battle a god. So, how did they do? We ask and answer some pertinent questions below. Spoilers ahead, of course! How different is the new party? It's way too early to tell if the party overall will take the same path as the first campaign's Vox Machina, which rose from obscurity to respectability with a heavy emphasis on becoming noted heroes and protectors of the realm. In terms of characters, I found it interesting to note that for the most part, players who had played spell-heavy characters in the first campaign (bard, cleric, druid) played characters without magic (thief, barbarian, monk), while most of the cast who played non-magic/light-magic characters (barbarian, ranger, rogue) the first time around are now playing magic wielders (warlock, cleric, wizard). Only Taliesin Jaffe bucked that trend, switching from one exotic martial class (gunslinger) to another (blood hunter). The cast largely veered toward the exotic when picking their characters' races. Of the classic D&D races, only humans are represented in the party. Instead of elves and dwarves, halflings and half-elves, we will be getting to know the ins and outs of goblins, half-orcs, aasimar (a race I had to look up myself), and particularly tieflings. How did the party form? At a tavern, of course. Where else do you form a party? Matt Mercer wisely had the cast form initial sub-groups that started the session already together. This gave everyone an existing relationship with at least one other character, helping the momentum toward forming a party. Each sub-group had apparently had some prior adventure (referenced during discussions among the characters) to raise them from level 1 to level 2, which is where the cast started the opening episode. Sam Riegel's Nott (a goblin rogue) and Liam O'Brien's Caleb (human wizard) wake in their upstairs room after an exceedingly long rest, their initial adventure having apparently taken quite a bit out of them. 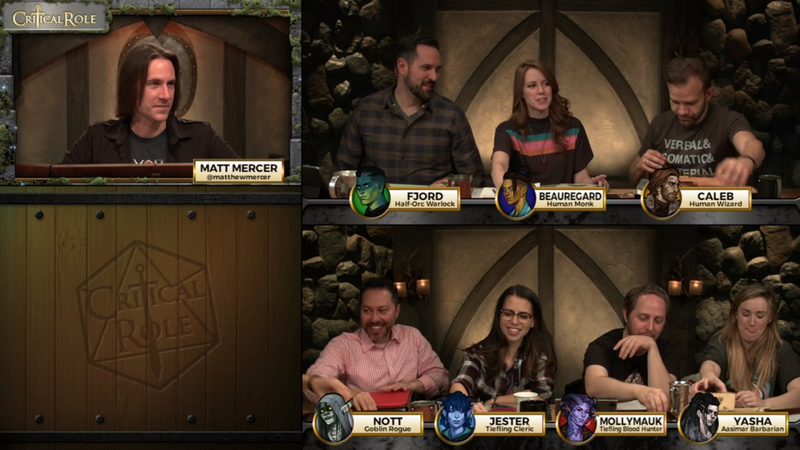 They run into Laura Bailey's Jester (tiefling cleric), Marisha Ray's Beauregard (human monk), and Travis Willingham's Fjord (half-orc warlock), in the tavern, splitting up the earnings from their initial adventure. The group then meet Taliesin Jaffe's Mollymauk (tiefling blood hunter) and Ashley Johnson's Yasha (aasimar barbarian) as the duo advertise the traveling show they work for. Who are the breakout characters? Time will tell. It's difficult to determine from a single session, since you typically only get enough to time to see one or two facets of a character and, as we saw with the first campaign, characters can change over time and evolve more depth than might initially be apparent. However, easily the two most endearing characters up front are Jester and Nott. She still owns far more dice than should be considered healthy. Jester, a cleric of a trickster deity, was by far the most outgoing of the cast during this introductory session. She is extremely talkative, takes an interest in others, and appears to have no filter. She seems incurably happy, with little care as to what others think of her. I have a feeling Jester's unfiltered mouth will end up causing the party no end of troubles in very entertaining ways. And Laura Bailey appears to be having a ton of fun playing her. Nott appears to have some physical or psychological issues that she deals with (the obvious affliction is kleptomania, though there could be something deeper going on). Riegel always impressed me with his game playing as both Scalan the bard and Taryion the artificer in the first campaign, and in this introductory session, he is already impressing me with Nott, who of course uses spare bonus actions during combat to check out the bystanders around her, looking for marks that she can pilfer from. Who are the mystery characters? One of the great strengths that Matt Mercer brings to the table as a campaign DM is his willingness to build campaign arcs around character backstory. While every character received that kind of spotlight at some point in time, some characters came into the campaign with built-in mysteries to uncover, such as Jaffe's Percy, who was in exile after his family's rule was overthrown by villains (who would end up having major impact on the campaign's overarching plot). For this campaign, my money is on Caleb and Fjord. Caleb has several attributes that give one pause, such as sleeping for unusual amounts of time (20 hours straight), wishing to build up his magical acumen while avoiding the local wizarding school, and his excessive filth, which was noted by many of the players, including O'Brien himself. In the meantime, Fjord did nothing during the initial session to signal an underlying mystery, but on twitter, Willingham replied with seemingly purposeful vagueness to fans asking about Fjord's lack of tusks in his official portrait. Will this campaign be as entertaining and successful as the first? That's really a question for the long term. However, with 90,000 watching live on Twitch during the opening minutes of the first episode (plus the countless others watching live on Alpha in addition to those streaming it afterward or watching it on the eventual YouTube posting or downloading the podcast version -- seriously, how many formats does this show need? ), they are certainly starting off strong. Only minor ones, in my opinion. The first episode ended with Mollymauk under arrest and his partner Yasha on the run (and her player Johnson heading back to NBC's Blindspot for the time being), and it's not clear that the rest of the still-not-really-formed party has sufficient reason to try to rescue him. Mercer will have to do some deft DMing to give this collection of strangers the motivation to put themselves out for someone they just met without it seeming artificial and forced. When it comes to character play, Ray played Beauregard with a surprising number of the same tics as her previous character, Keyleth. Both seem purposefully socially inept, which is strange considering both have high wisdom and Beauregard has above average charisma. I would have expected her to want to go in a completely different direction when it comes to mannerisms to give her character a fresh start. But that's a minor nit. 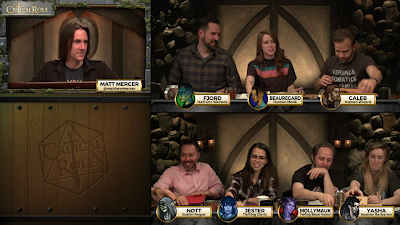 In addition, Riegel decided to have Nott burst into song during her first combat, a throwback to his bard, Scanlan. This didn't seem to fit the character given otherwise she tended to try to avoid attracting attention and, given Nott is a rogue, was useless in combat. It was also extremely unpleasant given the voice that Riegel has adopted for Nott, though that was part of the joke. While Riegel is a brilliant improvisational lyricist, I'm hoping he sticks the songs on the shelf for this character. The new retro intro video is cute (and the funk version of the theme song is awesome), I'll be looking forward to the point where the characters are settled and secure enough to do a proper filmed intro. The first roll of the campaign was, of course, a natural 20. I have a feeling that CritRoleStats will be featuring a count of the number of times the word falchion is uttered. The new table from Wyrmwood Gaming is pretty freaking awesome.